Facebook Live is a big, important product for the world's biggest social network. But up to now, many users still don't really know what Live is, or how to use it. Or they might be intimidated by live broadcasting, and reluctant to try it out. A new international ad campaign launching Monday in the U.S. (and Sunday night in the U.K.) aims to address those issues—and get more and more of its user base aware of, and willing to try, a Facebook Live broadcast. The ads, created by Facebook's in-house creative team The Factory, feature videos that were recorded by real Facebook users, all shot using Facebook Live on a phone, to capture the fun and spontaneity of the format. The campaign will be launched in two stages. The first stage, launching Monday, is about awareness and will feature short vignettes of Facebook Live broadcasts running on TV and on Facebook as 15-second spots. These spots, along with some digital billboard creative, will begin with a 3-2-1 countdown. "These ads are meant to introduce the campaign. We want people to see these clips and feel inspired to go Live with their friends," Rebecca Van Dyck, vp of consumer and brand marketing, tells Adweek. See some that work below. Two weeks later, on Monday, Nov. 7, the next phase of the campaign will begin—a tutorial phase that will focus on showing people how to go Live, not just the results of going live. This phase will be "a little more educational—the ads are a fun guide for how to go Live," says Van Dyck. "It's the same aesthetic, but in many cases very site-specific. For example, we have one on a billboard in Times Square that literally says, 'How to Go Live in Times Square.' "
All of the content for the campaign—every video, ever photo—was shot using Facebook Live on a phone. None of the dialogue was scripted. Indeed, The Factory found the footage for the campaign from real people using Facebook Live. "You have the ability to control your audience settings on Facebook, and anytime anyone goes Live and sets their post to 'public,' it shows up on this really fun Facebook Live Map that anyone can access," says Scott Trattner, vp and executive creative director for brand marketing at Facebook. "[We were] all over that map, finding different moments where people were using the product. From there, we reached out to people and asked if we could use their videos in our campaign." Thus, the creative is meant to be as authentic as going Live is. "The lion's share of the 3-2-1 vignettes were created by people using Facebook Live," says Trattner. "It's all real people. There were a few tutorial films where we gave people a prompt, but the entire campaign is unscripted. What's also cool is that the entire campaign was shot on the product [Facebook Live] using iOS and Android phones. We had some minor cleanup here and there, but the overall campaign is authentic—just like Facebook Live." This feel-good vibe, combined with the lighthearted clips themselves, is designed to counteract anxieties Facebook users might have about broadcasting live, which after all can be an intimidating move. Users know exactly what they're posting when they put up legacy Facebook content like status updates and photos, but broadcasting live is a different experience—and can make the user feel much more vulnerable. "We really looked to the community," says Van Dyck. "People love going live, but when we looked at some of the research, it indicated that people are sometimes intimidated. A lot of people think Live isn't for them. Knowing these barriers, and knowing that we wanted to make it easy, fun and enjoyable to go live with friends, it was important to us that the campaign focused on both awareness and education." She adds: "It was also helpful that there is so much great live content already out there. So the first part—actually finding the content—was a lot of fun. And from there, we looked at the different places people go live, where they might be inspired, and the different moments people use the product." In a blog post, Facebook CMO Gary Briggs writes: "Over the past year, we've been amazed by all the ways that people, public figures, and publishers have used live video to share moments with others. 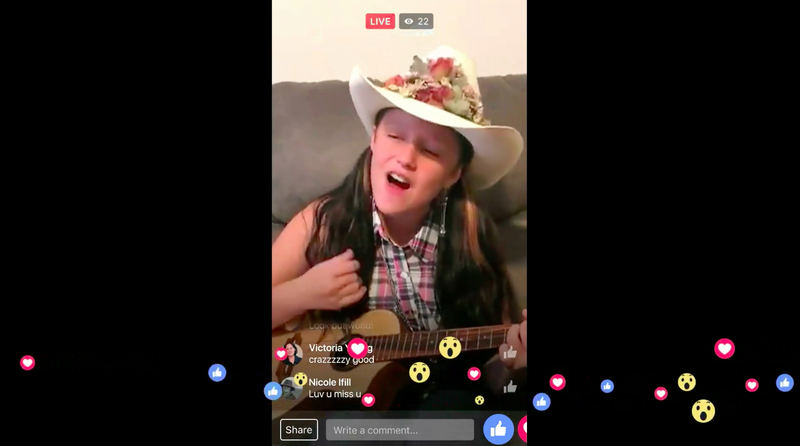 Facebook Live brings people together in real time for moments both silly and significant. It's authentic and interactive, and it helps you share your experience in the moment with people you care about." He adds: "Every day at Facebook we work to make the world more open and connected, and we hope this campaign helps people more easily share their experiences with others."